NOTE: The stills accompanying this review are taken from various online sources and do not represent the quality of the Blu-ray under review. 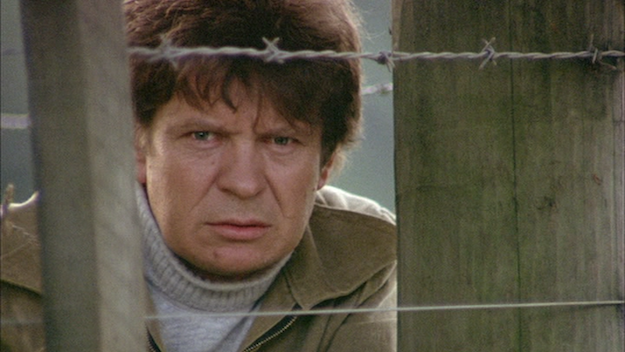 The 1977 action-drama Sleeping Dogs is credited with kicking off New Zealand's filmmaking New Wave. Overall, it's a humbler run of films than the earlier international New Waves, but it's a run that turned out some well-liked cult items, like Geoff Murphy's The Quiet Earth, and set the table for future Kiwi filmmakers, like Jane Campion and Peter Jackson, to capture the attention of international audiences. Despite its remarkable place in world cinema history, Sleeping Dogs is a fairly unassuming hybrid of low-key character study and paranoid political thriller. First-time feature director Roger Donaldson (he later made Hollywood fare, like Cocktail, Species, and Thirteen Days) merges these two stylistic modes in ways that emphasize both the charm and the flaws of the storytelling. Donaldson gives his actors room to produce grounded, naturalistic performances, and he knows how to stage a pulse-quickening setpiece on a low budget. Both of those qualities are welcome, but Sleeping Dogs (perhaps inevitably) is alternately too flabby to be a relentless, wham-bam genre piece and too shallow to be a truly thoughtful speculative drama. 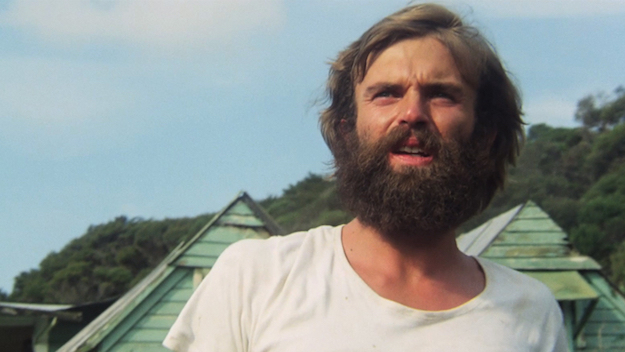 Sam Neill, also making his debut as a cinematic leading man, plays an earnest young fellow named Smith. At the beginning of the film, New Zealand is in political turmoil, with violent clashes in the streets between fed-up working-class protestors and government special forces. But Smith isn't concerned about that; he's had his heart broken. After learning that his wife Gloria (Nevan Rowe) has been seeing another man, he leaves her and his small children to find something else. When Smith discovers a small, vacated island, he thinks he has found what he's looking for. It feels like the set-up for a fish-out-of-water dramedy, complete with disbelieving Maori landlords, who wryly view Smith as a fool. Even the title of C.K. Stead's source novel, Smith's Dream, seems to imply some sort of hard-won uplift is in the offing. But rather than telling a story of a man who withdraws from the outside world to remake life on his own terms, Sleeping Dogs is a film about how the outside world violently thwarts Smith's attempts to withdraw from it. It turns out that the island is actually where some local agitators have stockpiled their weapons. After a nearby bombing, authorities ransack the island for munitions (they find them) and capture Smith as an enemy of the state. Smith manages to escape and spends the rest of the film on the run. He changes his name to Barry Brown, and finds cover as a handyman for a sleepy motel. But Smith's would-be idyll is interrupted again when a squad of American military men, on the scene to assist the Specials, takes up residence at his motel. Warren Oates is their leader, and his signature brand of gruff machismo makes his brief appearance a clear stand-out. The rest of the cast is solid, if a little po-faced. Sam Neill particularly reads as uncertain whether his character should ever be able to have an untroubled moment. "The character is thoughtful, so I should always look like I'm thinking hard," one presumes he told himself before every take. Ian Mune, as the man who steals Smith's wife and then turns out to be a key leader of the resistance, makes for a strong foil. Nevan Rowe doesn't get much screen time, but she and Neill have a natural rapport that makes their relationship feel lived-in. Even with its imperfections, Sleeping Dogs has a self-possessed energy and off-kilter point-of-view that is refreshing. This isn't a New Zealand film trying to pass itself off as Hollywood product; this is a film proud to be exactly what it is. Sleeping Dogs is Region A and Region B compatible. The disc comes with Arrow's typical reversible artwork, featuring either a new cover by Sean Phillips or the original poster artwork. The first pressing of the disc also includes a color booklet featuring Pauline Kael's review of the flick, an essay by Neil Mitchell, and the text of the film's original press book. As usual, Arrow offers a generous bitrate for this AVC-encoded 1080p 1.85:1 transfer. Even so, certain shots look like they might have some light noise reduction or other minor filtering. In general, the flick looks good in motion, with well-resolved film grain. Color palette is lifelike and well-saturated. Depth and clarity fluctuates, but this is probably owed to the original production and the film elements. Some dirt and speckling, but nothing too distracting. We get two options: a DTS-HD MA 5.1 surround remix and the original LPCM 2.0 mono mix. Both are clear and satisfying, but I personally prefer the focused quality of the original mono mix over the diffused FX placement of the surround version. There's plenty of low-end during the big action scenes either way, although some of the gunshots stick out as clearly being canned effects from a library. One subtitle option: English SDH. Audio commentary by director Roger Donaldson, star Sam Neill, and co-writer/co-star Ian Mune - Like the 2004 making-of below, this is carried over from the 2004 DVD release. There's a ton of information that overlaps with the doc, but the three speakers clearly have a fondness for each other, which gives the track a light-hearted, nostalgic flavor, making it a good listen. The Making of Sleeping Dogs (1977) (HD upscale, 28:41) - A well-made behind-the-scenes special that is mostly on-set footage. It captures some nice candid moments with the cast and a lot of footage of the crew working out stunts and other logistics. The Making of Sleeping Dogs (2004) (HD upscale, 1:07:38) - A retrospective doc that offers some unused vintage footage, but mostly presents talking-head reflections from the cast and crew, detailing the development of what was an unprecedented project for New Zealand filmmaking. Sleeping Dogs has a special place in film history as the first New Zealand film to get U.S. distribution (after Sam Neill was already a "name" on these shores). But thankfully, it's more than just an artifact. The same youthful energy and ambition that informed the European and Japanese films of the '60s and the American '70s is just as palpable here. It's not a perfect film, but its unique qualities go a long way toward making this a satisfying watch. Recommended.